Women in Science: Happy New Year! I'm back home from a visit with my parents for Christmas. Other than the eightish hours of traveling each way*, it was very relaxing and enjoyable. Over at Dr. Isis's place, people are sharing their shoes. My own footware leans towards the practical and boring - my go-to shoes for the winter are brown Mary Jane flats and black shoes with low chunky heels. Not worth blogging about, I don't think. 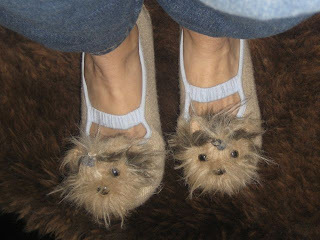 But I will share with you my new slippers, which I have dubbed my Fifi-killers. They are both comfy and a bit odd, which is why I enjoy wearing them around the house. Thanks mom! I'll be back to posting more regularly next week. Have a fun and safe New Year's Eve! * If you need the location of the slowest Burger King in Bakersfield, I'd be happy to share.